Today: Sometimes, a brownie just wants to be. Friends, we need to have a talk about brownies. 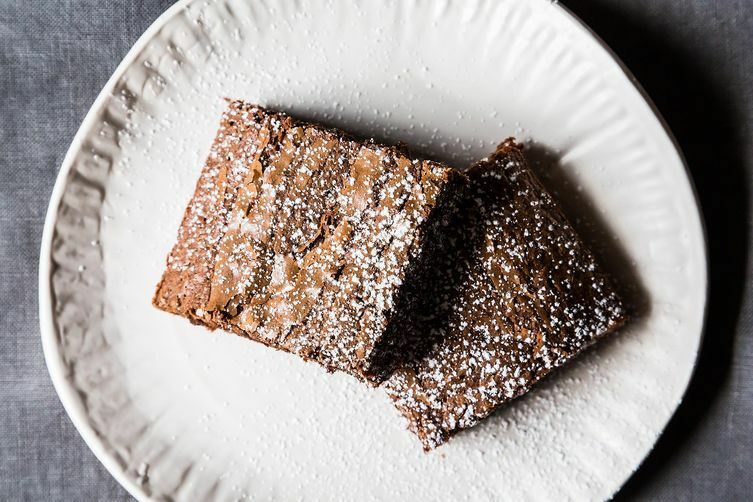 So kids, if you want to whip up a really fast weeknight brownie that is rich and delectable and simply out of this world, I highly recommend Mollie's Brownies. This recipe is classic in its proportions: lots of butter, less flour than some cake-ier versions but more than other classic versions, four large eggs. Heat your chocolate and butter over a low flame please. Let it cool a bit as your sugar and eggs come together in that tell-tale ribbon of bliss, then put the rest of it together and get it all in the pan. Test often so as to not over-bake. Take them to work. Make the world happy. Anna, if you cook it longer (dry toothpick) it will be cakier. Absolutely perfect brownies...thank you for this recipe! I gasped when I saw this post & shouted, "Jenny made Mollies Brownies!" The fact that I shouted this to an empty house doesn't diminish my joy. My ancestor is a little more famous today. I get what you're saying but if you have coeliac, the new fngled versions are more than welcome. agreed. but my comment was more on the lack of the standard versions available here. I love the tell-tale ribbon of bliss! Thank you for defending the regular-old-brownie, Jenny.